We at ComicsAlliance have never been shy about our love for Kieron Gillen and Jamie McKelvie's excellent indie Phonogram. We named The Singles Club the fifth-best comic of 2010, broke the story about Phonogram's end, and wondered hopefully at the teasing implications of a return. When The Immaterial Girl was announced in 2012, we celebrated, and when we heard it was pushed back to 2013, we were a little crestfallen. But when it was announced that Gillen and McKelvie would be the creative team on the relaunch of Young Avengers, we figured we could probably wait a little longer. We were right. Five issues in, the creative team has made Young Avengers one of the most exciting and experimental books on the stands, and one of the few comics about youth that actually captures the energy and potential of it. Great teen superhero books seem like a tough nut to crack. There have been classics, but for each comic that gets it right, there are probably twice as many that get it wrong. For every New Mutants, there's GeNext and Generation X. For every Teen Titans, there's, like, every single Supergirl series ever. 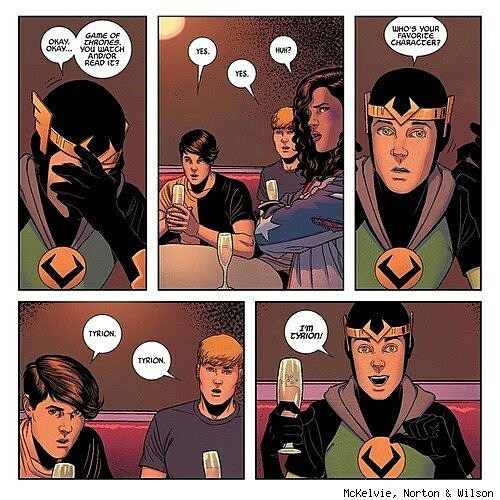 The original Young Avengers series got it absolutely, one hundred percent correct. If you've never read it, you don't have to in order get an idea of what's happening in Volume 2; just read it because it's awesome. Epic scale, complicated relationships, the discovery of self, the acceptance of personal responsibility, all that good stuff. 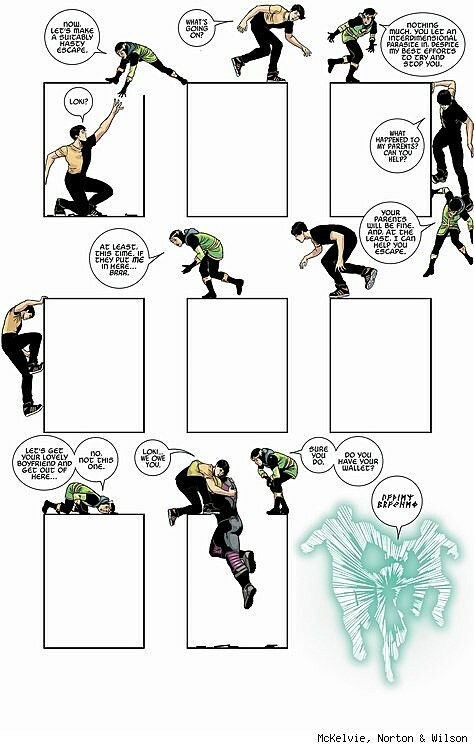 So how does the new Young Avengers replicate what made the first series so great? It doesn't. Doesn't even try. Just blows right past it in a blur of nightclub glitter. Instead of trying to repeat the formula from the first series, the new book takes a completely different approach, letting the kids out past midnight and watching them revel in the insanity of emerging adulthood. These characters are no longer a bunch of sidekicks trying to squeeze some heroics in between home and school, they're young heroes out to have as good a life as possible. The first Young Avengers series was about teenagers trying to be superheroes. The new series is about superheroes trying not to be teenagers. And from page one it's clear that the usual rules of young superheroes don't apply. 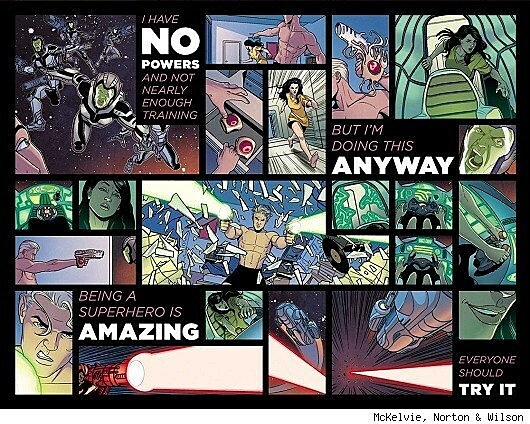 Literally, page one, Kate Bishop wakes up in Noh-Varr's ship, after a one-night stand with the banished Kree warrior, who's also part-cockroach. Hulkling and Wiccan are completely in love and shacked-up. They live with Wiccan's foster parents, and in separate rooms, but still! Openly gay teenage superheroes? Living together? In a realistically portrayed, loving relationship? Young women and alien cockroaches being each others' babies to the sound of the Ronettes? Where's the outcry, people? The first five issues team up former Young Avengers members Hulkling, Wiccan, and Hawkeye, with Noh-Varr from Marvel Boy, Miss America Chavez from Vengeance, and young Loki, who Gillen made into one of the most fascinating, likable, and ultimately untrustworthy characters in the Marvel U in Journey into Mystery. Their first mission as a team? Kill their parents and move out. When Wiccan sends out a powerful spell to bring Hulkling's mother back to life, he ends up awakening an inter-dimensional parasite that takes the form of dead parents, possesses living ones, and pacifies every other adult so that they can't see what's actually happening. And in keeping with superhero tradition, nearly all their parents are dead, psychotic, or both. So, literally, they have to kill their parents over and over again, and get away from the living ones. The larger metaphor of the plot sets up several smaller ones that illustrate the conflict between the young and the old, and the assumption of personal freedom. When Teddy (Hulkling) says "We need to find a place away from parents. A clear space to do whatever we have to," he's talking about finding a nice open area where they can wail away on a bunch of goo-beasts without more joining the fight, but he's also really talking about he and Billy (Wiccan) moving out and establishing their independence. The Phonogram team was really the perfect choice to relaunch Young Avengers. As he's proven over and over again, Kieron Gillen is an unceasingly erudite and clever writer who ably mixes action with humor, and light stuff with heavy stuff with no bumps in the pavement. He keeps the quiet moments interesting, gets his exposition across in tweets, and fully understands who all these characters are and how they should interact, especially in the case of Wiccan and Hulkling. Many times in superhero comics, as good as the intentions are, gay relationships come across clumsy, forced, or just plain unbelievable. (Which is saying something in books filled with flying people.) In Young Avengers, Billy and Teddy act like a real couple who say and do the type of things that a real couple would. The dialogue between them and the others is quick, realistically youthful, and just the right amount of self-aware. A great team dynamic emerges over the course of the first five issues: Billy and Teddy are the heart, America is the cynic, Kate is the rebel, Noh-Varr the outsider, and Loki the wild card. Speed and Prodigy are scheduled to join in issue six, but it's hard to believe they wouldn't do anything but add even more punch to an already explosive dynamic. These are all characters caught in various transitions, straddling the lines between childhood and adulthood, superhero and regular teenager, extra-terrestrial and human, and, in Loki's case, good and evil. Beyond the crackling teenspeak, each character is dealing with their own conflict in their own ways. Artists Jamie McKelvie and Mike Norton have a division of labor much like Dave Sim and Gerhard's on Cerebus, where McKelvie handles the layouts and the characters while Norton fills in the backgrounds, and it's a great pairing. 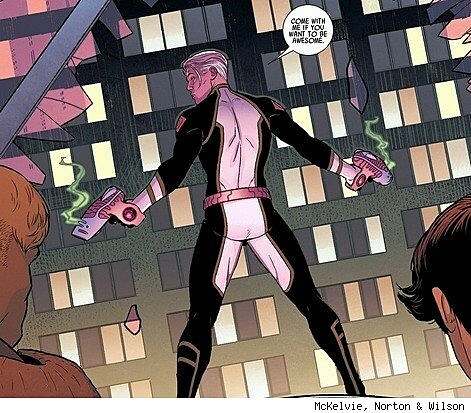 As usual, McKelvie dazzles with his energetic page designs, spectacular sense of motion, and facial expressions and mannerisms that are unique to each character. 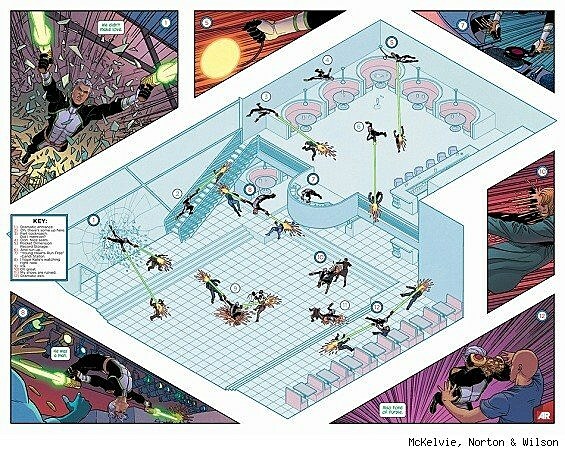 Norton adds depth, keeps the characters grounded in realistic environments, and along with the startling colors of Matthew Wilson, gives McKelvie's zonked-out layouts an extra oomph. Together, the three are making one of the best-looking, most experimental comics on the stands. While the Marvel house style seems to be "just make it like a movie" these days, the Young Avengers team is one of the few that clearly understands that this is a comic book, and only comic books can do certain things. Over the course of five issues, Gillen, McKelvie, and company have created a fast-paced, witty, vibrant, and emotionally engaging story that looks entirely unlike anything else being published today. While many superhero comics are stuck in a rut replaying the past or unsuccessfully trying to update themselves for a new generation, Young Avengers gets it right, and gets it right now. The sixth issue drops this Wednesday, in your local comic shop and on Comixology. Pick it up if you want to be awesome.